Tunay Kurban won second place at the Mozart Academy International Piano Competition and the Tadini International Music Competition in Italy, which was organized on June 5. 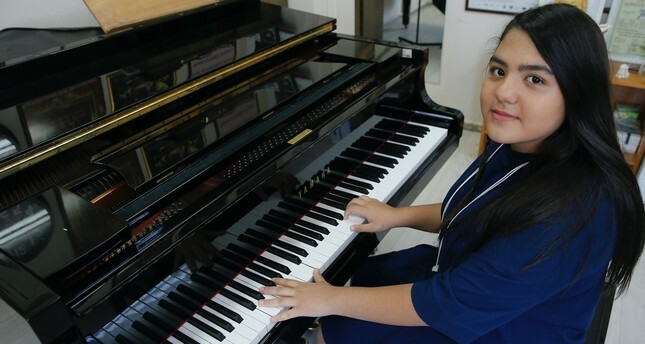 Tunay Kurban, 12, who came in second at the Mozart Academy International Piano Competition's Young Talents category in Milan, Italy, has been experiencing the happiness of representing Turkey successfully. Kurban met the piano at the age of four when her brother started taking music lessons at home. The piano teacher who came to their house realized the little girl's love for the instrument. After a while, Kurban started to take lessons from the same piano teacher. Drawing attention with her talent, the little girl continued her education at a music school which presents progressive music exam system in more than 90 countries. Kurban won second place at the Mozart Academy International Piano Competition and the Tadini International Music Competition in Italy, which was organized on June 5. Leaving 16 rivals of the same age behind, Kurban made her family and country proud. Kurban said that she feels peaceful whenever she touches piano keys. Noting her family supported her very much, she said, "Every success directs me to new aims. Lastly, I took place in the competition in Milan. The more I play piano, the more I feel self-confident. I am happy to make my family and Turkey proud. I hope I will improve and have new successes." She mentioned that she wants to get piano training at a conservatory. Stressing that she wants her profession to be about music, the little pianist continued, "I started preparations for this aim. My family and my friends at the school supported me. It makes me happy that some of my friends who take me as an example started to play piano." Demet Eytemiz, Kurban's piano teacher of three years, said her student has achieved a lot of success in a short period of time. "Music comes first for her like a conservatory student. It is a great success to win this competition as an amateur. Music has an important place in the lives of people. Children should especially get into it," Eytemiz stated. While the little pianist's mother Vefa Kurban said that she is very proud of her daughter, her father Asıf Kurban stated that he likes listening to his daughter play piano and is sure she will be a great pianist one day.